For eons, humankind has looked up to the sky and wondered if it was alone. While we still haven’t answered that question just yet, fiction has stepped in to show us what that moment of first contact might look like. Sometimes it has led to a golden age of human space exploration. Sometimes, it brings on death, destruction, and basketball games. But either way, the visitor from another world story is one that humanity never tires of telling itself. Here are the five most successful and the five most hostile first contacts with aliens in fiction. Everybody get up it’s time to slam now, and welcome to possibly the most insane first contact story ever conceived. Not only are aliens real, but so are the Looney Tunes, and the aliens want to enslave them for use as theme park attractions, so they steal the talent of professional basketball players in order to beat the Looney Tunes in a game… It’s pretty complicated, but luckily Michael Jordan, Wayne Knight, and Bill Murray are there. One thing I can say for sure is that if the Nerdlucks are the only other sentient life in the galaxy, I don’t want to live in this universe anymore. Sometimes first contact is an invasion. And when you combine that idea with Roland Emmerich’s penchant for destruction, you get a bad day for Earth. The aliens in this film come to take over, but instead give us one of the most iconic images in action cinema: a death ray that destroys the White House. Prometheus and Alien: Covenant have retconned first contact in this universe back a few decades, but when the original 1979 scifi classic premiered, that was the moment (wo)man met monster. Few first contact stories are more chilling than watching the xenomorph and her offspring pick off the crew of the Nostromo, one by one, until only Ripley is left alive. 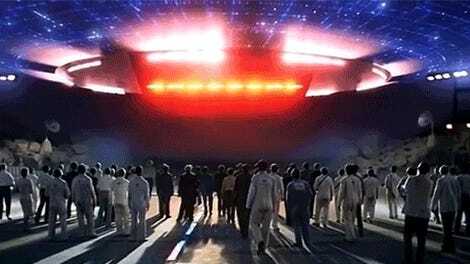 Plus, it’s a first contact that the people back home will barely believe. All around, it’s a bad way for things to go. Whether you mean the original novel, Orson Welles’ famous radio hoax, or Steven Spielberg’s 2005 film, the story of technologically superior (but thankfully virus susceptible) aliens wreaking havoc on our unsuspecting planet remains one of the greatest first contact tales of all time... and one of the most deadly. While true first contact is made when Ford Prefect first touches down, Earth at large is made aware of the presence of extraterrestrial life just before a bureaucratic species known as the Vogons destroy the planet and nearly everyone on it in order to clear space for an interplanetary highway. The first volume of this Douglas Adams’ absurdist masterpiece spends nearly no time on Earth, but it dispatches with our home planet so callously and for such a banal reason, it’s truly an awful way to go. Aliens were commonplace in the Men in Black universe long before Will Smith’s J joined the agency, but Tommy Lee Jones’ Agent K was there from the beginning. First contact in this movie has turned Earth into a safe place for secret alien immigration, bringing a ton of technological advances along with it—and, sure, a few Earth-destroying possibilities as well. You take the good with the bad. No matter what Enterprise had to say about the partnership of Vulcans and humans, it was this first contact that led to the creation of the Federation and Starfleet. And, you know, helped Earth get out of a post-apocalyptic nightmare and take its place among the stars. A linguist and a physicist (played by Amy Adams and Jeremy Renner, respectively) lead a group of scientists in trying to decipher an alien language before the militaries of the world attempt to bomb the aliens’ ships out of the sky. The humans are the only problems in this first contact; the aliens are here to help. Is there anything better than aliens showing up because they’re fans? The Thermians have molded themselves off an Earth TV show they believe is real, and they truly think humans are as good as they are on TV. And that belief is inspiring enough to get some washed-up, bitter actors to help them. If you don’t tear up every time you hear “by Grabthar’s Hammer” after seeing this film, you have no soul. This is the heartbreaking tale of a boy, his robot, and the world that won’t leave them be. After a superweapon from another world crashes to Earth, a young boy named Hogarth teaches him that he doesn’t have to be a monster, even if the army won’t be convinced otherwise. Many aliens come to take over our world; some even come to take humanity to the next level, technologically. But I can only think of two that embody the ideals of humanity better than humans themselves: Superman and the Iron Giant.